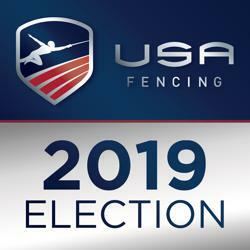 The USA Fencing Nominating Committee is pleased to announce the names of the parties that it has nominated to run for election to the positions indicated. NOTE: Other candidates may be nominated for these positions. The Bylaws describe the requirements for nomination by petition. Congratulations to the nominees, and many thanks to all who submitted applications and participated in the process. Decisions were based on a number of factors, demonstrated understanding of the roles they were seeking; past officerial, Board of Directors, Committee experience; and/or applicable business experience and background. In addition, the nominating committee took into account the balance of talents and skills already on the Board. The committee members were Jimmy Moody – Chair (athlete representative elected by the athlete council), Alan Kidd (USA Fencing independent director), Dan Kellner (elite coach), Lew Siegel (past president of USA Fencing) and Sean Shumate (national tournament official). The Nominating Committee will be submitting an official report in the coming weeks to the USA Fencing Board of Directors. The process now moves to the Election Committee which will be establishing the timing of the election this spring; the rules for the posting of electioneering materials on the website; and the method of balloting. Details will be communicated via email and posted on http://www.usafencing.org as they become available.